Here is a little story. My husband likes to open the packages that come in the mail. We had been talking about picking up Beef Jerky so when he opened up the box he saw BEEF JERKY, opened the package and began chowing down. He yells to me from the other room thank you for the beef jerky. Me going through my head doesn't remember ordering any Beef Jerky, then it hits me but before I can respond he is saying that they taste really good but they are a bit gritty. I bust out laughing trying to tell him it was for our Saint Bernard Princess Goliath. He told me I had to tell the story because he said they were really that good. 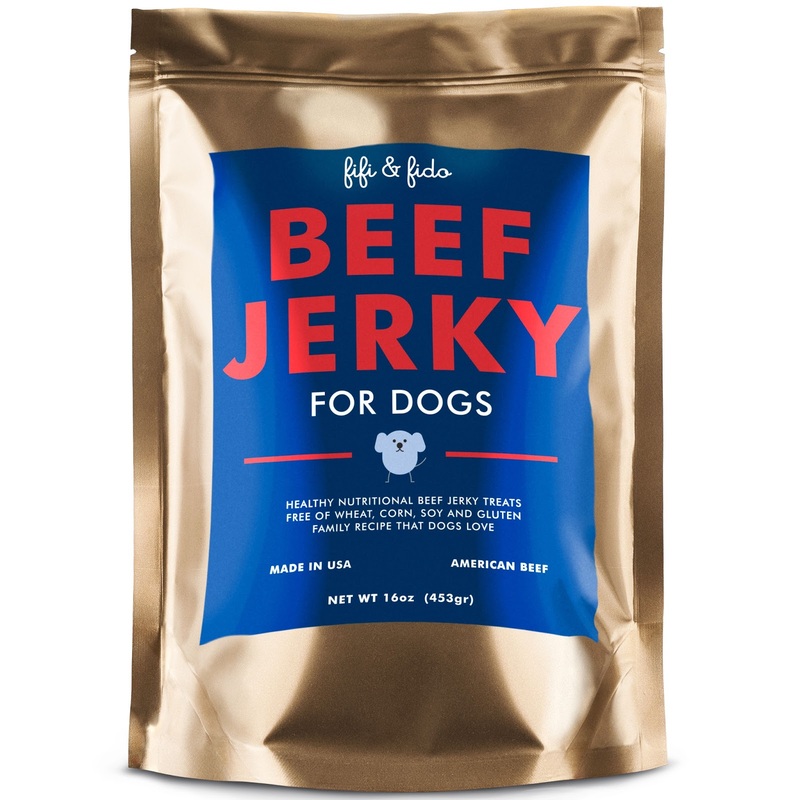 *These Beef Jerky treats are not made for human consumption, but goes to show you a dog really is mans best friend so much in so that they like the same diet in food. Finally Princess was able to try them out after I confiscated the bag away from my hungry and very disappointed husband. She won't eat them when I give them to her, I think she waits till we are away to eat them because when we come home they are gone. You can purchase Fifi & Fido Beef Jerky on Amazon. What Fifi & Fido have to say about their product. HEALTHY PET TREATS YOUR DOG WILL LOVE Pet-lovers today want gourmet treats that contain no unhealthy artificial ingredients. Fifi & Fido Beefy Jerky Treats are a healthy dog treat alternative. Made with a pure and simple recipe that contains high quality, all natural, USA ingredients. Fifi & Fido Beefy Jerky Treats are a perfect reward for any dog in training and for dogs that want a healthy treat with the optimal blend of easily digestible ingredients. Fifi & Fido Beefy Jerky Treats are excellent for dogs in all life stages. Fifi & Fido Beefy Jerky Treats are low-odor, deliciously slow cooked treats, made from 100% USA pure beef. No added foreign ingredients from China! Our high-quality Fifi & Fido Beefy Jerky Treats are baked in a SQF certified facility that adheres to global food safety standards. The healthy dog treat alternative! Wheat, corn, grain, and soy- free with no added sugar or wheat gluten. No-mess treat sticks, that are easily breakable for training, and can be just as easily concealed in hands and pockets when training your furry best friend! 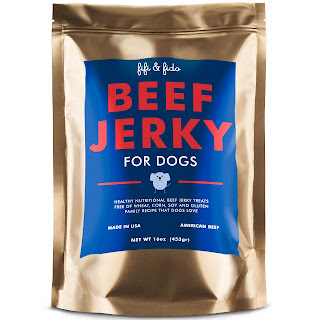 Fifi & Fido Beefy Jerky Treats are packaged in attractive, resealable pouches. Treats come in packets of 10. A favorite of dog-lovers and trainers, these treats can be easily broken into just the right size for training treats. 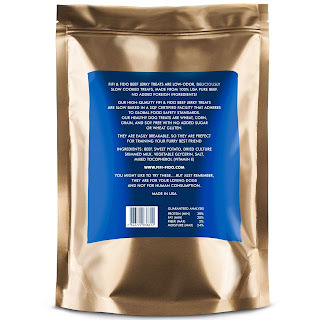 Low-odor, yet a beefy favorite, great for training rewards at home or outdoors. Non-messy, non-sticky, Fifi & Fido Beefy Jerky Treats make life with Fido that much more fun! So, if your best friend deserves a treat now and then, I highly recommend you click the link below and order Fifi & Fido Beef Jerky Treats. The moment the parcel arrives I know you'll be impressed. Disclosure: MarksvilleandMe received one or more of the products mentioned above as part of a promotion with Tomoson and Fifi & Fido. Regardless, MarksvilleandMe only recommends products or services we use personally and believe will be good for our readers. Some of the links in the article may be “affiliate links.” This means if you click on the link and purchase the item, I will receive compensation. If you would like MarksvilleandMe to review a product or service please contact us at marksvilleandme@gmail.com.